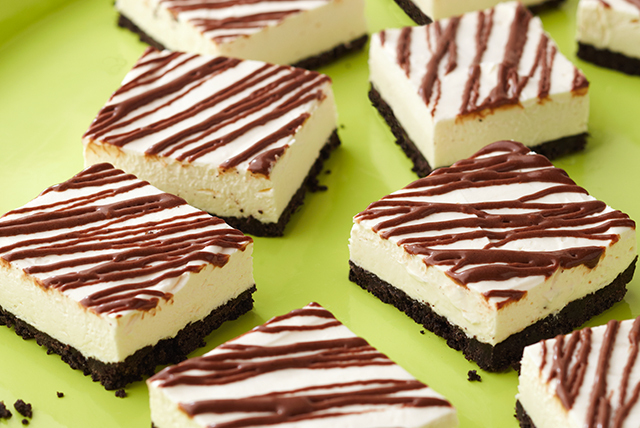 Being square is totally in, especially when you're as cool and creamy as these Frozen Cheesecake Squares with drizzled chocolate. Line 9-inch square pan with Reynolds Wrap® Aluminum Foil, with ends of foil extending over sides. Mix cookie crumbs and butter; press onto bottom of pan. Beat cream cheese, sugar and vanilla in large bowl with mixer until light and fluffy. Add 2 cups COOL WHIP; beat on low speed until blended. Spread over crust. Freeze 4 hours or until firm. Microwave remaining COOL WHIP and chocolate in microwaveable bowl on HIGH 1 min. ; stir until chocolate is completely melted and mixture is well blended. Cool slightly. Use foil handles to lift cheesecake from pan. Drizzle with chocolate mixture. Spoon chocolate mixture into small resealable plastic bag; seal bag. Cut small piece from bottom corner of bag; squeeze to drizzle chocolate over dessert.